Reaching Out To The West, Iran's Leader Wins Support At Home : Parallels President Hasan Rouhani won mostly positive reviews in the U.S. this week and it appears he also got high marks in Iran, where his fellow Iranians have been feeling the squeeze of tough Western sanctions. 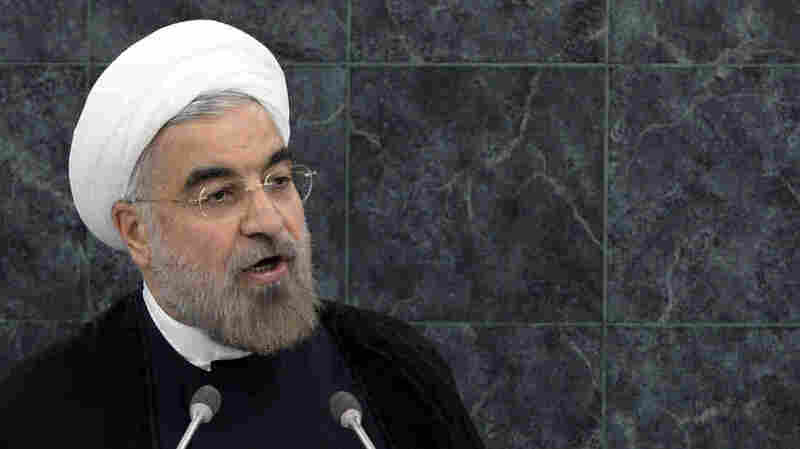 Iran's President Hasan Rouhani speaks at the U.N. General Assembly on Tuesday. With his outreach to the West, he received mostly positive reviews in the U.S., and most Iranians, who are being squeezed by sanctions, also appear supportive. Iran's President Hasan Rouhani has been well-received in the U.S. this week with his United Nations speech and other remarks that held out the possibility of the U.S. and Iran mending relations ruptured more than 30 years ago. As we've reported on Parallels, Rouhani still faces plenty of skeptics, though most U.S. media coverage has been positive. But how have his comments been received in Iran, where the country's economy has been hard-hit by Western sanctions? Pretty well, it seems, according to Thomas Erdbrink, The New York Times correspondent in Tehran. He told NPR's Morning Edition that Iranians were "looking at these talks with lots of anticipation and people are really happy to hear the reaction of the Western countries was so positive." The U.S. and European countries want a verifiable deal that ensures that Iran is not developing nuclear weapons. Iran, in turn, wants to remove the sanctions that have greatly reduced the country's oil exports and contributed to high unemployment and inflation. "The impact of those crushing sanctions affects [Iranians] with every step they take in their daily life," Erdbrink said. Double Take 'Toons: Iran Warming, Or Warning? "Parents who want to see their children have a better future, [they are] waiting for them to get married, to buy a house," he said. "They see a whole generation just withering away under the incredible force of these sanctions, which is just taking away their future, taking away any prospect of a better life." The U.S. and Iran have had several false starts over the past two decades as tentative moves to rebuild a relationship have collapsed and given way to renewed recriminations. In the past, Iranian hard-liners were sometimes blamed for undermining these efforts. But this time, Iran's supreme leader Ayatollah Ali Khamenei, who is considered a hard-liner, is supporting Rouhani's moves, Erdbrink says. "This means that for the first time [since Iran's 1979 revolution], Iran's leadership, which is always very ambiguous and often double-sided, is talking with one voice," Erdbrink says. If Iran's negotiations with the U.S. and the West make progress, hard-liners may try to intervene, he says. But for now, "the message from Iran's top leadership is, 'Leave these people alone, let them do their job, let's try to get these sanctions lifted.' "